The Best holiday home! We have owned it for 14 years now and whilst our lives have changed with the addition of young children to our family, our holidays have just got better every year. The house is very large with about 250 M2 of space internally and a different balcony or patio for each day of the week! Its perfect for entertaining or just chilling out! Downstairs there are two lounges, one with the TV and DVD set up, the other based around a fireplace with the dining room leading off behind. The kitchen is fully fitted and has a breakfast bar area as well. The master bedroom is huge with a sumptuous en suite bathroom, there is another two en-suite bedrooms and then two shared bathrooms for the third double and twin bedded room. Outside, the ten metre pool has has a grass surround at the lower lever with the larger larger upper level laid as patio for barbecues, eating outdoors or just enjoying the beautiful sunsets! The new water restrictions for Camps Bay and the whole city mean that we ask all guests to adhere to the rules in place at the time of your holiday. Everyone is having to do their bit at this difficult time until a long term solution can be found but we have found so far that guests have been able to enjoy their holidays and understand the problem and enjoy trying to help. Bedroom no 5: We are now able to offer the house as a five bedroom house which can sleep 12 adults or children plus the additional use of a travel cot. The great thing about it is that the house is big enough to accommodate this number thanks to its huge living areas both inside and outside the house. The prices we advertise however do not include the use of the 5th bedroom because we know that the average number of guests is between 4-8 people and so to assume parties of 12 would make it too expensive for for smaller groups to consider. So if you require a big house for family or friends this is definitely for you! We were married in 2005 and have three young kids that just love our family holidays abroad so we are really lucky to be able to visit such exciting places. It had such great potential - big entertaining areas inside and out, balconies and views for everyone. Its so close to everything. You can walk to the beach and the nearest shops, bars and restaurants while its only 10 minutes into town by car, 30 to the airport and nothing is too far away. Yes but please use sensibly. Philomina will help as required. Electricity is expensive in SA so please don't run it daily with one t-shirt. For similar reasons, we do not provide a tumble dryer. Two spaces in the garage. The drive is steep but would take two more. Failing that, there is street parking as well. As mentioned, automatic doors open the double garage. Private bikes are locked inside. 40 inch Sony TV and dvd and full Satellite TV as mentioned above. Also now available in the master bedroom. There is a simple hifi in the dining room. There are private bikes locked away. Please ask. Our family thoroughly enjoyed our stay in this clean, comfortable house with the bonus of a pool to cool down in at the end of a day of touring lovely Cape Town. Housekeeper Philomina kept everything in order, which made our holiday even more relaxing. Thank you to all! So glad you had a great time, hope you will come again! Just finished our week’s holiday at Ocean Sweep. It is a fabulous family home with everything we needed to enjoy a relaxing multi-generational family trip. The house is really spacious and well appointed with wonderful views over the bay. There are lots of lovely sitting areas and a great pool so everyone can find the space to relax or be together as the mood takes them. If you want to eat in, it has everything you need but if you prefer to dine out it’s only a short walk down to the buzzing strip of Camps Bay which is full of lively and delicious restaurants. Camps Bay makes an excellent base for visiting Cape Town and the surrounding areas. We were really well looked after by the delightful Philomena who couldn’t have been nicer. Charl was also brilliant and sorted any problems out immediately (of which there were only a couple of small ones like a temperamental safe!). I would recommend this house to anyone and would definitely come again. So glad you had a good time - do let us know when you want to come back! We stayed for 6 nights as a group of seven adults. The house is spacious and comfortable. We enjoyed using the BBQ on the evenings we were at home. The views across the bay are spectacular - particularly so when sitting with a sundowner! A maid was available to come in every day - she came to us alternate days which meant the house was beautifully clean and tidy. At the time of our visit there were strict water regulations. This meant taking two minute showers and collecting as much water as possible in the shower in a bucket for re-use. We drank bottled water which was plentiful, so no real problems. There was a very high wind one night which triggered the alarm about 6am with a prompt and reassuring attendance by the armed response team. It is a ten minute walk downhill to the front and the beach. An Uber is very cheap and easy if you prefer not to walk back up hill! We drove into Cape Town and parked easily in the car park at the V&A Waterfront. Altogether we had a great time and would thoroughly recommend both this house and Camps Bay. The house is exactly as described (not always the case when renting properties) and we loved it so much we are already looking to book again for the same period next year. The location is great - a 10 minute stroll down to the beach and the restaurants and bars in Camps Bay but also only a 15 minute drive over the hill and into Cape Town and all the the V&A Waterfront. The house has everything you need and the views are simply breathtaking - Lions Head to the side and Table Mountain and the 12 Apostles behind the house - I could sit there all day and just stare at that view. The house is safe, secure and alarmed - the alarm did go off the very first night as we had left some washing on the line at the back of the house - it was quite windy and this set it off. We immediately received a phone call from the security company and their personnel were ringing the doorbell within 5 minutes to check everything was ok. From booking right through to departure, communication with the owner and Charl the manager was fantastic and we loved having Philomena, the housekeeper, around to help keep the house spotless and tidy and also answer any questions we had. I can't recommend this property enough. Thanks Louise - it was lovely to have you to stay an dee look forward to seeing you again next year! Amazing house, views, space and pool! There is so much space indoors and out, it is fantastic. Great views, close to the beach, easy to get to, safe and secure. The pool is amazing, solar heated and 10m long, you don't always get the space to actually swim. Philomina was great too. We will be back! 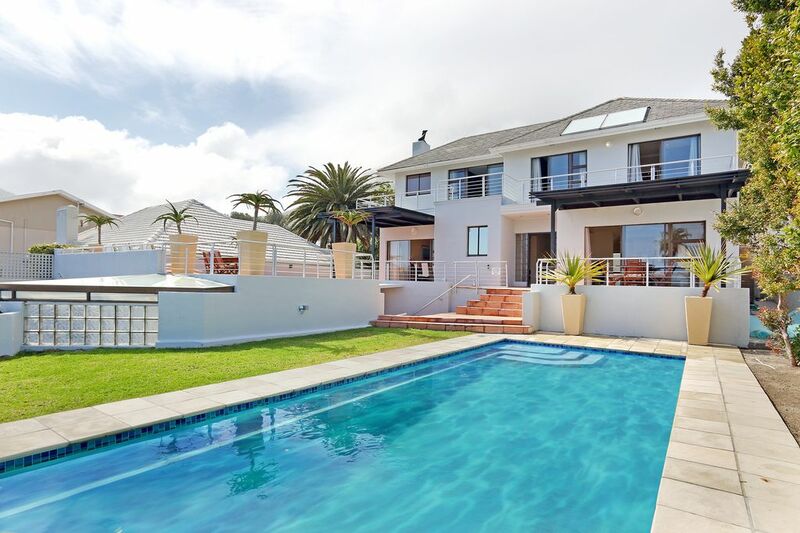 The house is in Camps Bay which is no more than half an hour's drive from the airport. Once there it is just a short walk to the beach front with all the shops, bars and restaurants that make this area so famous and memorable. Camps Bay is then just a ten minute drive into Cape Town city centre of maybe 15 to the V&A Waterfront, Stellenboch is about half an hour for wine tasting, or Newlands for all the sporting occasions is the same. Cape Point is a little further, south, at 45 min but on the way you pass beautiful Chapmans Peak and Boulders, the home of the Cape's penguins. There are numerous golf courses all over which start at as little as R300 a round, tennis courts in Camps Bay and the western beaches are famous to surfers and windsurfers alike. Its all there, its just a question of getting out and getting on with it! I'm sorry to have removed contact numbers from this website but we have received too many sales calls by leaving on there. Happy to call you back if you enquire. Golf: The nearest and most accessible golf course is Now Mowbray which you passed coming in from the airport and costs just R300. Call in good time and they will accommodate you into 4 balls if necessary. There are very many other courses to play however!